The Lawrence University Saxophone Quartet -- seniors Joe Connor, Garrett Evans, Daniel Vasey, and Colin Parsons -- are shown at the Frankfurt, Germany airport, on their way to perform at the World Saxophone Congress in Strasbourg, France in July, 2015. Daniel Whitworth is a junior from Highland Park, Illinois pursuing a Bachelor of Music degree in saxophone performance and music composition. He is currently the first chair saxophonist in the Lawrence Symphonic Band and plays alto saxophone with the “Organism” quartet. Daniel was recently awarded second prize in the 2015-2016 Lakeshore Young Artist Competition and performed Ingolf Dahl's Concerto for Alto Saxophone with the Lakeshore Wind Ensemble. Daniel has studied with Steven Jordheim, Sumner Truax, Sara Kind, and Jeremy Ruthrauff. In the Spring Term of 2016, Daniel studied at the London Centre and took saxophone lessons with John Harle. Daniel received funding through the Jordheim Fund to study at the American Saxophone Academy in Rochester, NY in the summer of 2016. Joe Connor is a senior studying in the Saxophone Performance and Instrumental Music Education programs and performs as saxophonist with Slipstream. Winner of the 2014 Lawrence Symphony Orchestra Concerto Competition, Joe performed Jacob ter Veldhuis' Tallahatchie Concerto with the LSO in March, 2014. Joe frequently performs with marimbist Greg Riss, and as winners of the 2013 Neale-Silva Young Artist's competition at Wisconsin Public Radio, the duo performed on a recital broadcast live on WPR in April, 2013. Joe was awarded First Prize in the 2012 Miroslav Pansky Memorial Concerto Competition of the Green Bay Civic Symphony and Second Prize in the 2011-12 Lakeshore Wind Ensemble’s Young Artist Competition, and he performed as concerto soloist with both of these ensembles. Joe studied at the 2014 American Saxophone Academy in Rochester, New York; the 2013 European University for Saxophone in Gap, France with Claude Delangle, Arno Bornkamp, and Vincent David; the 2012 International Saxophone Masterclass in Laubach, Germany; and the 2012 Eastman Summer Saxophone Institute in Rochester, New York. Daniel Vasey is a senior from Vancouver, Washington in the Bachelor of Music degree program, majoring in Saxophone Performance with a Jazz Emphasis and a minor in Mathematics. Daniel performs with the Lawrence University Saxophone Quartet, Symphonic Band, Jazz Band, and Jazz Combos. He was the winner of the 2010 Vancouver Symphony Orchestra Young Artist Award, a finalist in the Portland Metro Arts competition in 2011, and was awarded first prize for Washington State in the VSA international soloist competition where he performed at conventions in Seattle. As a composer, Daniel has written and arranged tunes for a student-organized hip-hop group, and he is exploring writing in various styles and idioms. Daniel has studied with Steven Jordheim, Sara Kind, Jesse Dochnahl, and José Encarnación. While in Vancouver, he has studied with John Nastos and Kim Reece. Jason Koth is a senior in the Bachelor of Music degree program in Saxophone Performance and Music Composition, studying saxophone with Steven Jordheim and Sumner Truax, and composition with Joanne Metcalf and Asha Srinivasan. Originally from Homer Glen, Illinois, Jason has studied saxophone with David Babich and widely-recognized new music proponent Ryan Muncy. As a senior in high school, Jason was awarded the first chair in the Illinois Music Educators Association all-state wind ensemble, and performed Robert Muczynski's Concerto for Alto Saxophone with the Providence Catholic High School Symphonic Winds. At Lawrence, Jason has performed with the Lawrence University Wind Ensemble and a saxophone quartet. Jason’s areas of interest include electronic and electro-acoustic music, which led him to an assistantship in the Lawrence University Electronic Music Studio under the direction of professor and composer Asha Srinivasan. A multi-instrumentalist, Jason frequently writes and records alternative and ambient music that utilizes the saxophone in non-traditional idioms. Colin Parsons is a senior from Park Forest, Illinois pursuing both a Bachelor of Music degree in Saxophone Performance and a Bachelor of Arts degree in Biochemistry. At Lawrence, Colin has studied under the tutelage of Steven Jordheim, Sumner Truax, Sara Kind, and Jesse Dochnahl. 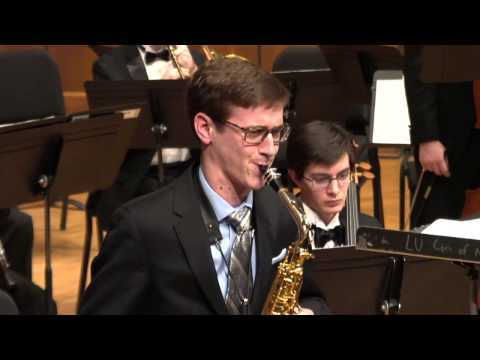 As a member of the saxophone section of the Lawrence University Wind Ensemble, Colin performed at UNC Greensboro in 2014 for the National CBDNA conference. Currently the baritone saxophonist in the Lawrence University Saxophone Quartet, Colin enjoys performing in the community for a wide variety of audiences, including recent performances for community organizations and schools as part of Lawrence's residency program with the Decoda chamber ensemble. In addition to his music study and performance activity, Colin is completing a degree in biochemistry. He has spent a summer doing research relating to the mechanisms of Angiogenin under his advisor Kim Dickson and spent the summer of 2014 at the Mayo Clinic in Rochester, Minnesota doing research with Lawrence alumnus, Jim Thompson (’89), focusing on targeted drug discovery and X-ray crystallography of the human enzyme Dihydrolipoamide Dehydrogenase. Sam Pratt is a junior from San Diego, California, and enrolled in the Bachelor of Arts degree program with majors in Music and Mathematics. Sam is an avid jazz player, performing on tenor saxophone with the Lawrence University Jazz Band and Jazz Combo and studying with jazz saxophone professor José Encarnación. Sam also plays bass clarinet with the Improvisation Group of Lawrence University (IGLU) and has performed on saxophone with the Symphonic Band. In addition to his pursuits in music and mathematics, Sam works as a writing tutor in the Center for Teaching and on the Conservatory Tech Crew.